Marks/Label: PRINTED ON PAPER: THE WAR OF 1914-1918/CANADIAN FORCES/133209 PTE. A.E. 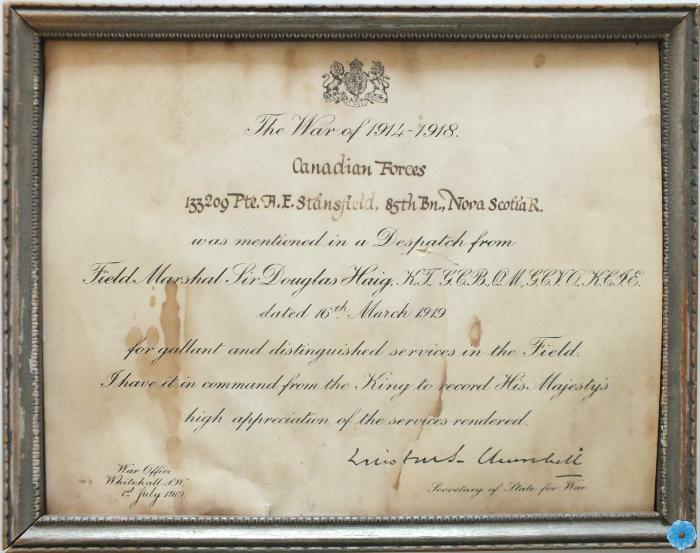 STANSFIELD, 85TH BN NOVA SCOTIA R./…HIGH APPRECIATION OF..."
Description: Certificate of Merit awarded to Pte. A.E. Stansfield, 85th Battalion N.S. The award is in a glassless metal framed.